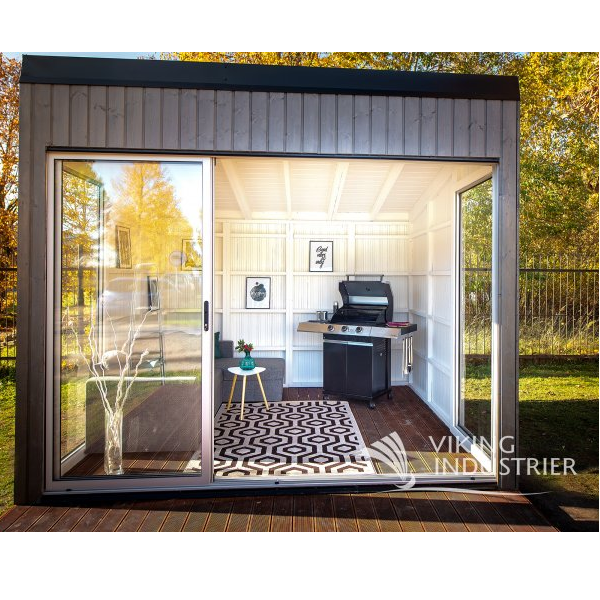 For the new Viking Easy Cube 3 x 3 m have been given special attention to high – speed and easy installation. This compact and bright product is designed as a multifunctional space where you can prepare food, spend your leisure. On a warm day, open large doors and enjoy unlimited beautiful weather, on a windy day you can admire the landscape from inside. 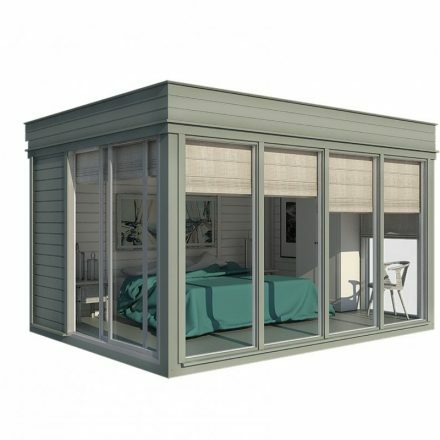 The style and dimensions of this product fit perfectly into a new residential area, a rural landscape or even a cottage environment. Roof. 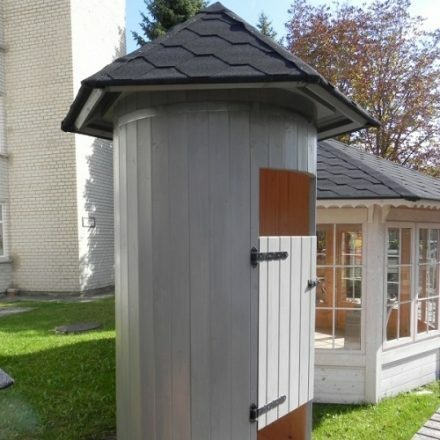 The roof panels frame 45 x 120 mm is covered with 18 x 145 mm finishing boards. 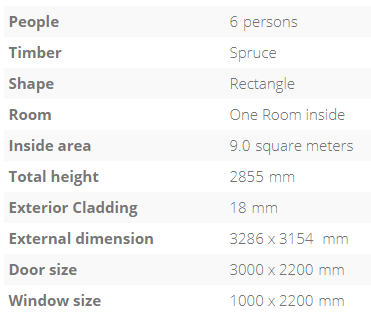 This type of construction withstands 295 kg/m2 = 2,95 kN/m2. Easy Cube building roof is 2.9 m high and 10% slope.We use MIDA SELF KSK for roof covering, its self-adhesive elastomeric bitumen membrane covering the entire surface. Installation of the rolled roofing is quick, simple and safe way to cover all Cube. All you must do is to unroll, attach with nails, remove protective film and press. 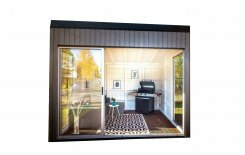 The cube’s solid wooden frame: front and back 45 x 95 mm; sides – 45 x 45 mm with 18 x 145 mm finishing boards make the product a sheltered lounge area. The product has aluminum glass wall on each side and three sliding doors (3 – rails) that can easily be opened in two directions! Walls. The walls are made of spruce wood from FSC-certified spruce forests. Front and back wall frame 45 x 95 mm with outside 18 x 145 mm vertical finishing boards. Side wall frame 45 x 45 mm with outside 18 x 145 mm vertical finishing boards. The bottom parts of wall frames are impregnated. Aluminum 3 rails sliding doors system Alutech. Sliding parts are framed with aluminum frames, manufactured from ‘’cold’’ single-chamber of aluminum profile with non-insulating gaskets. Sliding of the aluminum frame is made so that the entire structure is stable. 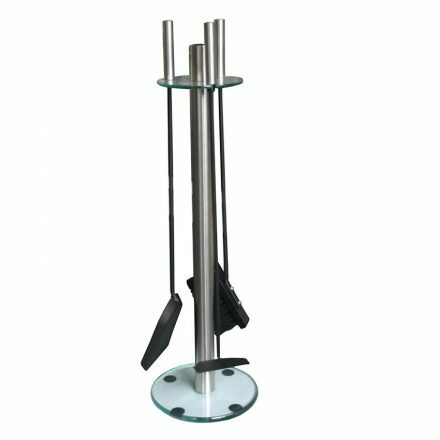 Frames wheels designed for attachment to the motion and has aluminum profiles for vertical and horizontal adjustment, provides a particularly easy movement of moving parts. Sealing brush prevents dust from entering the structure and compensates for vibration in the wind. All moving parts are very easy to remove and put it back, so there is no problem with cleaning glass from the outside. In the closed position system has automatically locked and unlocked positions. Handles and locks built into the aluminum profile, so during the opening, the glass always remains clean. This is single-chamber aluminum system. The thickness of tempered glass 4 mm. 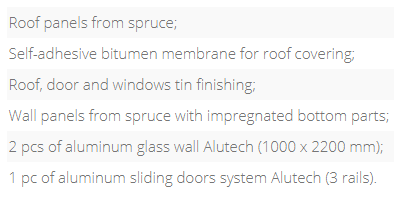 Aluminium glass wall “Alutech”. Panel size is 1000 x 2200 mm; Frame wide: 40 mm; Glazing: single glass; Glass thickness: 4 mm. Color: metallic/white.. MAINTENANCE. 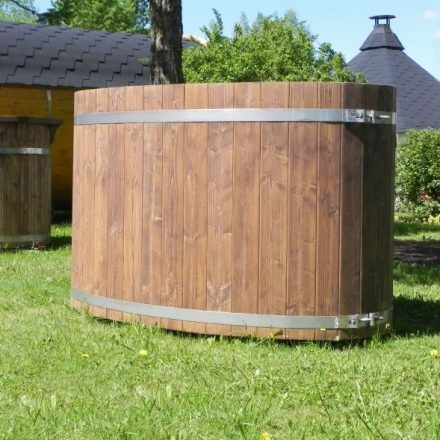 You should not forget that wood is a natural material, it change move depending on weather conditions. Large and small cracks, color tone differences and changes, as well as a changing structure of wood are not errors, but a result of wood growing and a feature of wood as a natural material. Natural wood (not impregnated) becomes grayish after having been left untouched for a while, and can be turn blue and become moldy. 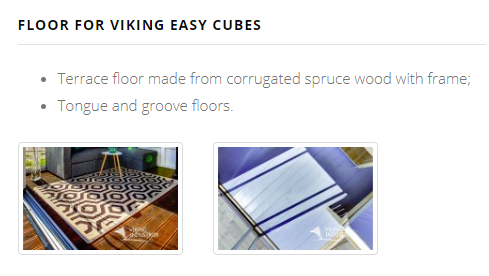 You should immediately process them with wood impregnations to protect the wooden details of our produced products. We definitely recommend that you process the door and windows with a wood impregnation agent, and do it namely both inside and outside, because the doors and windows can become twisted. 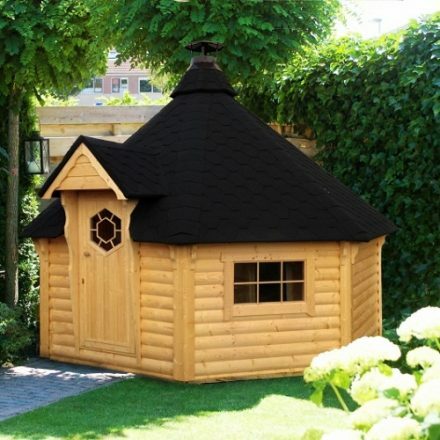 In general, we recommend for the conclusive finishing a weather protection paint that will protect wood from moisture and UV radiation after the house is assembled. 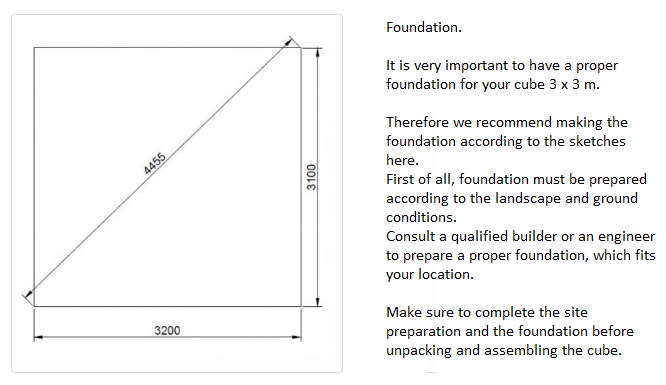 Consult a specialist regarding paints suitable for unprocessed softwood and follow the paint manufacturer’s instructions. Your Cube life time will be much longer after having properly painted. We recommend that you inspect the house thoroughly once every six month. Aluminium glass wall “Alutech”. Panel size is 1000 x 2200 mm; Frame wide: 40 mm; Glazing: single glass; Glass thickness: 4 mm. Color: metallic/white.